Full texts are added to this site four years after the letter is published in the print edition of the Correspondence. Transcriptions are made from the original or a facsimile where these are available. Where they are not, texts are taken from the best available source whether that is a draft, a published version, or a description (for example in a dealer's catalogue).The text of each letter has been closely checked against the original or a facsimile several times to give as high a degree of accuracy as possible. Original spellings (and mis-spellings!) are retained. 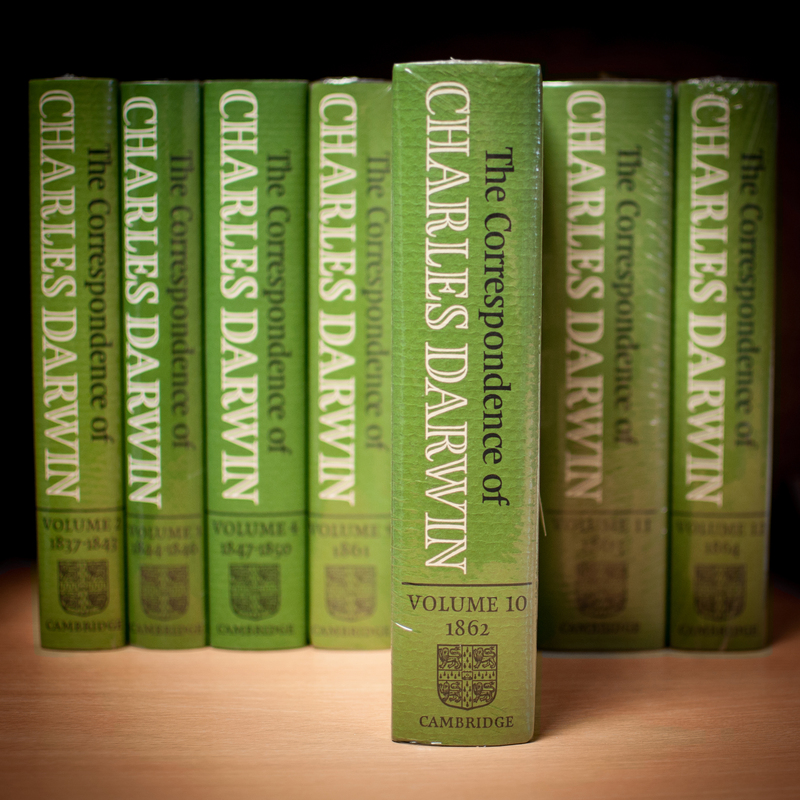 Anything Darwin wrote on the letters he received is given in the 'Annotations' below the letter (line numbers refer to the printed volumes and are not necessarily accurate for the website); changes he made to his own letters as he was writing them are not yet available on this site but can be found in the printed volumes of the Correspondence. Darwin did not usually address his correspondents by name in the salutation of his letters unless they were relatives – in which case he used their forenames, or close friends – for whom he used the surnames alone. Consequently for most of the letters written after the early 1840s (when envelopes began to replace covers on which the name and address as well as the text were written) the name of the correspondent must be conjectured. Many of the recipients of the letters have had to be identified by inference from the content and date of a letter or its reply, or some other indirect evidence such as its presence in a collection of private papers of the recipient. When the content is substantial or the subject matter is the special province of one or a few naturalists, detection and reliable identification are usually successful. Fortunately the difficulty of such identification is in inverse proportion to the substance: the letters supplying the fewest clues are in general also the least important ones. A doubtful identification is followed by a question mark. Darwin rarely gave the year when dating his letters, and frequently he wrote only the day of the month or simply the day of the week. This practice has made the establishment of firm dates one of the most difficult problems confronting the editors. As with the identification of the recipients, the problem of dating begins in the 1840s with the use of envelopes. When these were discarded, as they almost always were, the direct physical evidence that the postmarks usually provided was lost. Consequently a substantial number of letters have had to be dated only approximately. If a letter is in a series which contains a dated reply, the task is relatively easy. The content also can provide good clues, although subjects like earthworms and the expression of the emotions occupied Darwin over long spans of years, as did subjects that recurred as his works were revised for new editions. A helpful technique devised by Thaddeus Trenn and P. Thomas Carroll (described in Carroll, ed., An annotated calendar of the letters of Charles Darwin in the library of the American Philosophical Society, Wilmington, Del. : 1976, pp. xxii-xxiii) makes use of the changes in the Post Office address of Darwin’s home, Down House. However, the periods of time during which these addresses were in effect were, except when the postal district was Beckenham (1869-72), from four to eight years long, and in some cases they overlapped, so additional information is needed if the approximation is to be refined. The size, colour, weave of paper, and the watermarks, if any, are sometimes useful in dating Darwin letters, and mourning borders also provide help; but the writing medium, except for the months of January-March 1853, when Darwin used bright blue ink, is usually the same colour (brownish-black) and shade throughout long periods. Different styles of writing and signature occur within certain periods of time and help to narrow the possible time range. The best clues are in the texts themselves, in references to dated letters of the correspondents, in references to publications or events, and in endorsements made by the recipients at the time the letters were received. Square brackets enclose dates, or parts of dates, not in the orginal. Uncertain dates or elements of dates are indicated by question marks. The terms ‘before’ and ‘after’ are used in a strict sense. Thus a letter dated ‘after 8 July 1854’ is judged to have been written very soon after 8 July 1854, and is probably a reply to a letter of that date. One dated ‘8 July 1854 or later’ could not have been written before that date. Some letters bear both Gregorian and Julian calendar dates. Only the Gregorian has been used in the headline. If there is no address on a letter from Darwin, but there is some internal evidence for the place of writing, the editors have supplied the address, enclosed in brackets. They have also supplied correct addresses, in brackets, for those letters known to have been written away from home, but headed ‘Down’ for the benefit of Darwin’s correspondents, or because he wrote them on his printed stationery without changing the address. Missing addresses on letters to Darwin are not supplied unless good evidence is at hand. The summaries on the website are derived from those in the second edition of the printed Calendar. Where the full text of a letter is also given and there are discrepancies between the information in the summary and in the transcription, the transcription can be taken to be the more reliable. We will correct the summaries in light of later transcriptions in due course. The summaries are highly condensed restatements of the originals. Passages from the letters are rarely quoted; when they are, the style and spelling of the original are preserved, but punctuation is altered if literal reproduction would be misleading. An effort has been made to make the summaries as readable as possible within the constraints of the form, but their prime objective is to provide readers with enough information about the contents of the original to guide them to those full texts relevant to their interests.